Pool Repair Highland Park by Texas Fiberglass Pools Inc. offers a variety of pool resurfacing and repair services whether you own a residential pool and require pool resurfacing or you run a commercial pool and need regular pool maintenance visits. We’ve seen everything there is to see in swimming pool repair in Highland Park, and we’re ready to assist with your pool needs. 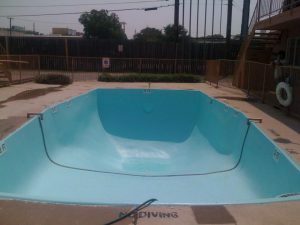 Highland Park fiberglass pool repair experts at Texas Fiberglass Pools Inc. provide Highland Park residents and business owners with a variety of swimming pool repair and pool maintenance options, Texas Fiberglass Pools Inc. will help you keep your pool in excellent condition. Regular maintenance and timely repair of your swimming pool, fountain, or hot tub ensures you won’t have any unexpected problems or need to replace your swimming pool earlier than expected. Don’t wait to call us about swimming pool repair or pool maintenance. Whether it’s summer and you’ve seen a huge increase in the amount of water used to fill your pool, or it’s winter, and you want to see if it’s time for pool resurfacing, the professionals at Fiberglass Pools Remodeling LLC are here to help with every pool-related issue you have. Let us maintain your pool and keep it in tip-top shape in every season. Regular maintenance of your swimming pool or fountain helps ensure the pool remains usable for many years, but virtually all pool owners must deal with plumbing repairs at one point or another. In addition, it’s very common to experience cracks in the plaster of old swimming pools, and damage to the decks and cement that surrounds the pool. Timely repair of your swimming pool is essential because problems like cracks and plumbing leaks may greatly increase your home or business’s utility bills. A small, insignificant leak might not seem like a big deal, but it can add up to hundreds of dollars of extra bills each year. At Texas Fiberglass Pools Inc., our Highland Park fiberglass pool repair technicians only employ the best techniques, and we only use the best parts to ensure our repairs are done right the first time and last as long as possible. Do you have a question about your pool, baptistery, fountain, or anything related to a pool? We can diagnose any problem and perform any repairs necessary to get your pool back to normal. We’ll also use our experience to resurface and improve your pool, so it’s ready for use for many seasons and family or business events. Contact Texas Fiberglass Pools Inc. today for a free consultation or to request a service. Do you have a question about your pool, baptistery, fountain, or anything related to a pool? Our Highland Park fiberglass pool repair experts can diagnose any problem and perform any repairs necessary to get your pool back to normal. We’ll also use our experience to resurface and improve your pool, so it’s ready for use for many seasons and family or business events.